BCS #194 is out, a special double-issue kicking off BCS Science-Fantasy Month 3! Yoon Ha Lee (“Two to Leave” in BCS 174 & podcast BCS 151, “The Pirate Captain’s Daughter” in BCS #27 & podcast BCS 025, among many others) returns to BCS with “Foxfire, Foxfire,” a story that blends fantastical shape-changing fox spirits with futuristic mechanical walking tanks. “Call and Answer, Plant and Harvest” releases on the website next Thursday, in text and as a bonus podcast episode BCS 169 guest-narrated by M.K. Hobson. The full issue is available now on ebook at Kindle and Weightless Books. The first BCS Audio Fiction Podcast episode with BCS #194 is BCS 168: Foxfire, Foxfire, the Yoon Ha Lee story of fox-spirits and mechanical tanks. It’s guest-narrated by Michael J. DeLuca, BCS author and narrator of past podcast episodes including BCS 153: The Girl with Golden Hair” by Bonnie Jo Stufflebeam and BCS 123: Sekhmet Hunts the Dying Gnosis: A Computation by Seth Dickinson, from BCS Science-Fantasy Month 2. 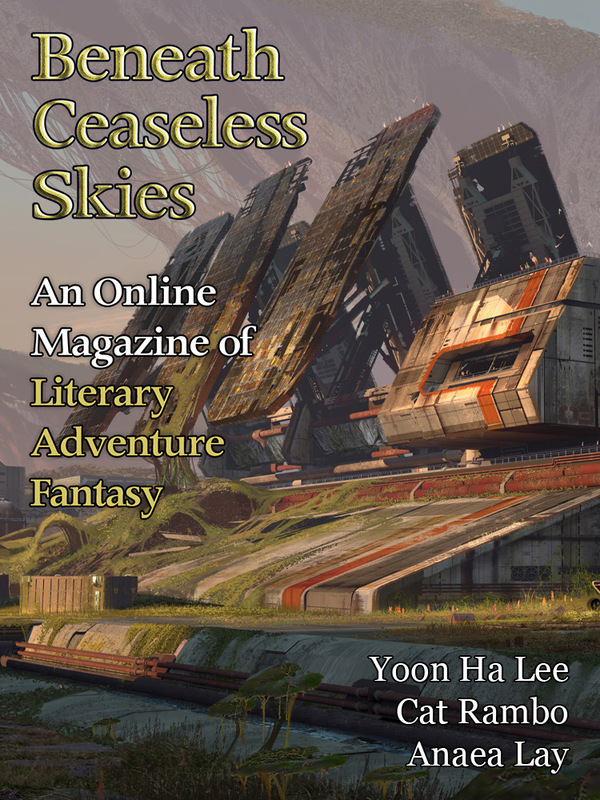 Also releasing next Thursday is a new episode of the BCS Audio Vault podcast: Yoon Ha Lee introducing the podcast of his story “The Book of Locked Doors” from our Science-Fantasy Month 1. The ‘From the Archives’ story with BCS #194 is “Scry” by Anne Ivy from BCS #90 in BCS Science-Fantasy Month 1, a tale of family relationships and the fate and free will of seeing their future. The special science-fantasy cover art is the futuristic yet bleak “Research Lab” by Sung Choi. BCS Science-Fantasy Month 3 will continue next week, with the website release of the bonus story, bonus podcast, and BCS Audio Vault podcast, and in two weeks with BCS #195, featuring Aliette de Bodard (whose story “The Breath of War,” from BCS Science-Fantasy Month 2 and podcast BCS 121, was a Nebula Award finalist), Jason Sanford, and Sarah Pinsker!